I love the energy and newness that comes with a new year. Did you see last weeks post about goal setting? This months posts are all going to help you stay on track with your goals and help you look and feel good in 2017. Every year I always make it a goal to eat whole and healthy foods. Being vegan I generally eat healthy but sometimes (a lot of the time) I like to eat out and treat myself to dessert. If you live in Calgary these are the healthiest and tastiest places to eat out and not feel bad about it! When I think of healthy food I think of Raw Eatery. Raw was created by two boss babes who have made a huge impact in the Calgary food scene. If you didn't figure it out already most things on their menu are raw. I was always scared that raw food wouldn't make me feel full but I was definitely wrong. Everything I have tried was full of flavour, I felt satisfied, and it just made me feel so good! I love that there is a place I can go out to eat healthy but is also affordable. I highly recommend taking carnivores or raw-food hesitant people or anyone really because it will seriously blow their minds. And as if you didn't need more reasons to go there, when you eat at Raw you can feel good about creating a positive impact ethically, environmentally, and health-wise on the world. They also have some amazing Canadian-made products in the "market" part of the space. Make sure to go check them out! Find them on Instagram, Facebook, and their website! The Coup is hands down my favourite restaurant in Calgary. They are a fully vegetarian restaurant that uses organic and GMO-free local ingredients. Every one that I take to The Coup absolutely loves it. There is so much variety on their menu which means you will fall in love with something (or many things, like I have). They have the best drinks, all the food is whole, fresh, and has such healthy ingredients. My favourite things are the coconut chai latte, the avocado toast, and the almond satay noodle bowl. And besides having good food, the Coup offsets their waste by planting 36 trees a month, they compost, and they only use post-consumer recycled paper products. So amazing. Hope to see you there! Find The Coup on Instagram, Facebook, or their website. 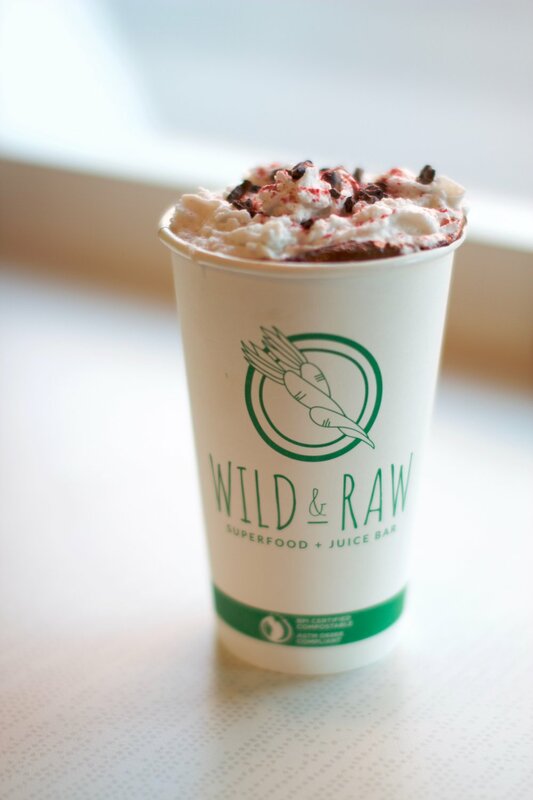 Wild and Raw is not your average juice bar. Inspired by the vibes, food, and drink from Thailand, Bali, India, and other countries in Southeast Asia, Wild and Raw has superfoods that will heal you from the inside out. I'm not joking when I say every single thing on their menu will make you feel so happy and glowy and reconnected to your food. They use the best quality organic superfoods for their amazing elixirs, juices, smoothies, and food. Pictured above are some items from the new winter menu which you have to check out ASAP before it's gone! 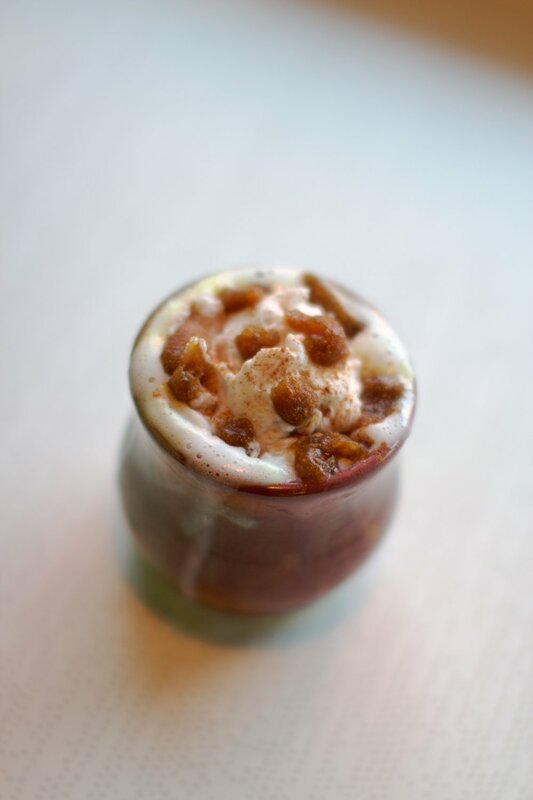 I cannot get enough of the Caramel Apple Cider, my mouth is salivating just thinking about it. It's the perfect drink on a cold wintery day (or any day). Find them on Instagram, Facebook, and their website. Is there anything better than dessert that is good for you? I think not. I have a serious sweet tooth and was so excited when I found First Date Confections! These treats cut out the major food allergens and sensitivities so that everyone can enjoy them. They are created without nuts, gluten, dairy, soy, eggs, and refined sugar! They are sweetened by a piece of mejdool date in the center while the rest melts in your mouth. The creator, Tatiana, makes these healthy treats from scratch and can customize the chocolates to fit your food sensitivities or just a flavour preference! I love that they are made with antioxidants and good-for-you ingredients so I don't feel guilty when I eat them. These will be the best First Dates you ever had (get it?!). You can find First Date Confections at The Clothing Bar in Calgary or order online here. Don't forget to find First Date on Instagram. WHAT'S YOUR FAVOURITE PLACE TO EAT THAT MAKES YOU FEEL GOOD? LET ME KNOW IN THE COMMENTS BELOW!